Hélène Pitrou was a child, growing up in Paris during the dark years, the years of German occupation. [Check the book by historian Julian Jackson, France–The Dark Years 1940-1944]. Hélène kept a diary, un journal, as one says in French. When I check one of the entries in Hélène Pitrou’s diary for this week in the war, specifically for Wednesday 29 January 1941, I read [and this is translating roughly from the French] that her frightful teacher, Mr. Bourgeois, told the class that morning that three students, namely Josette Goldstein, Suzanne Weil, and Marguerite Grumbach, must move to the back of the room. Josette asked why. Then, with the whole class watching, the teacher said that the three girls should consider themselves lucky that they were allowed remain at all. One quickly notices that those names sound Jewish, and indeed they are. Persecution of the Jews, both in the Occupied and Unoccupied zones was being ramped up at this stage of the war. The Vichy regime (and particularly Pierre Laval) was not merely complicit, but enthusiastic. Walk the streets of Paris and stop at the occasional school. Often, there is a plaque outside in memory of the many Jewish children who were sent to the French concentration camp at Drancy and thence to the extermination camps in eastern Europe. Hélène’s diary is not exactly like the Diary of Anne Frank. Hélène was not Jewish. And she attended school. She did not have to go into hiding. There is one further and significant difference: Hélène Pitrou never existed. She is a fictional creation of French author, Paule Bouchet. 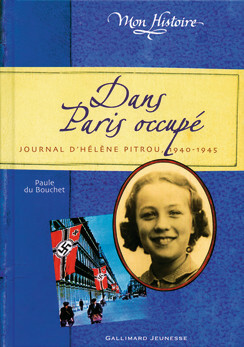 Dans Paris occupé—Journal d’Hélène Pitrou, 1940-1945, supposedly written by Hélène but actually written by Paule Bouchet, is a gem of French children’s literature. France is only now beginning to reconcile itself with the dark years, and there is a need to engage the young, to provide accounts and explanations that school children will relate to. For something closer to the Diary of Anne Frank, try the diary of another Hélène. 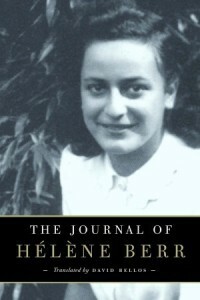 The Journal of Hélène Berr (translated into English by David Bellos) was published by McClelland & Stewart in 2008. Hélène Berr’s diary records her life in German-occupied Paris. She was a graduate of the Sorbonne, but was denied entry into postgraduate studies. Like Anne Frank, Hélène Berr was Jewish and, like Anne, she ended her days as a concentration camp prisoner and died of typhus shortly before the war would end. This entry was posted in Book, World War II and tagged Dans Paris occupe, Drancy, Helene Berr, Helene Pitrou, Jewish children, Jews, Julian Jackson, Laval, Paris, Paule Bouchet. Bookmark the permalink.